This article originally appeared  on TheCityFix.com. In Beijing, Chennai and Fortaleza, the rate of fatalities from road crashes is 20-27.2 deaths per 100,000 residents. What do these cities have in common? They have traffic lanes wider than 3.6 meters (11.8 feet). A long-standing belief among transportation planners and engineers is that wider traffic lanes ensure safe and congestion-free traffic flow. Recent academic research , highlighted in Cities Safer by Design,  a WRI Ross Center for Sustainable Cities publication, shows that wider lanes are more dangerous than narrower lanes. 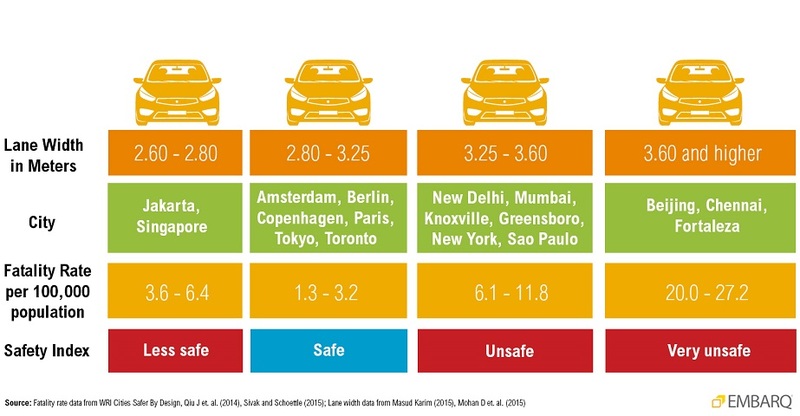 To further investigate how cities are stacking up against the existing evidence, the Health and Road Safety team of WRI Ross Center for Sustainable Cities decided to compare typical lane widths in selected global cities with reported traffic fatality rates. Narrower travel lanes, coupled with lower speed limits, can foster a greater sense of awareness among drivers. Narrower lanes also ensure shorter crossing distances for pedestrians at intersections, which reduces the risk of an accident . In 1963, Lewis Mumford  said: “Increasing road width to reduce congestion is the same as loosening your belt to fight obesity.” In fact, increasing road space by having wider lanes doesn’t reduce congestion due to rebound effects . More road space results in generating more traffic. Research  shows that 3 meter-wide lanes have 93 percent of the road capacity of 3.6 meter lanes—not a noticeable difference. In addition, if narrower lanes reduce speeds, this should not put great strain on vehicle movement. A recent study  from Grenoble shows that private vehicles take only 18 seconds longer to travel a kilometer on a road with speed limit of 30km/h as compared to a road with a speed limit of 50km/hr. Moreover, signal delays at intersections create congestion—it rarely depends on mid-block traffic flows. Road dieting  is a technique of narrowing lane widths to achieve sustainable and safer pedestrian and cyclist environments. If cities embrace narrower lanes, there are a range of possibilities for re-designing city streets to make them safer and more accommodating for pedestrians and cyclists. Most cities in developed countries, like the United States, follow road design guidelines from standard-setting bodies like the American Association of State Highway and Transportation Officials’ A Policy on Geometric Design of Highways and Streets , commonly known as the Green Book, which actually allows lane widths to vary between 10-12 feet (3.0 to 3.6 meters). While the book provides a range, engineers tend to design streets with the maximum lane width, due to the ill-informed notion that wider lanes are safer and can help reduce congestion. Many cities in low- and middle-income countries have adopted this same approach, erring on the supposed side of caution.